Season 5 of Vikings debuted on November 2017, to finish first part on January 2018. Second Part Aired on November 2018 and concluded on January 2019. Season 6 oF Vikings is most likely to start on November 2019 and conclude first part in January 2020. Season 6 marks the beginning of the end of Vikings. The History original series, which first premiered in 2013, will end after its sixth season. The news was first reported by Deadline and has been confirmed by GameSpot. The final season of the Michael Hirst created historical drama will debut later in 2019, though production has already come to an end. It’s not all bad news, though. A potential spin-off is in the works. According to Deadline, the new series would be co-created by Hirst and Jeb Stuart, who was one of the screenwriters on 1988’s Die Hard. It’s unclear how the new series would follow the Vikings story. 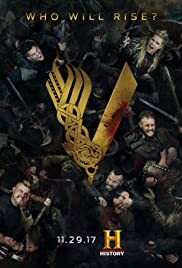 Of the original Vikings cast of regulars, only three actors remain on the series: Katheryn Winnick (Lagertha) and Gustaf Skarsgård (Floki) are still regulars, while Clive Standen returned in Season 5 in a recurring role as Rollo. Travis Fimmel, who led the series’ first four seasons as King Ragnar, saw his character killed off in Season 4 as Vikings shifted to follow the story of his sons. It’s entirely possible the proposed spin-off could follow one or more of them.